BC songwriter Eileen McGann has been called “one of the finest contemporary Canadian singer-songwriters of today.” (Celtic Heritage Magazine, Halifax) In The Eileen McGann Songbook, the latest entry in The Essential Canadian Songwriter Series, McGann’s songs are made available in print for the first time in her almost thirty-year career. This beautifully laid-out, spiral-bound book includes 50 of Eileen’s written and recorded songs, with melodies, lyrics and complete chord charts. 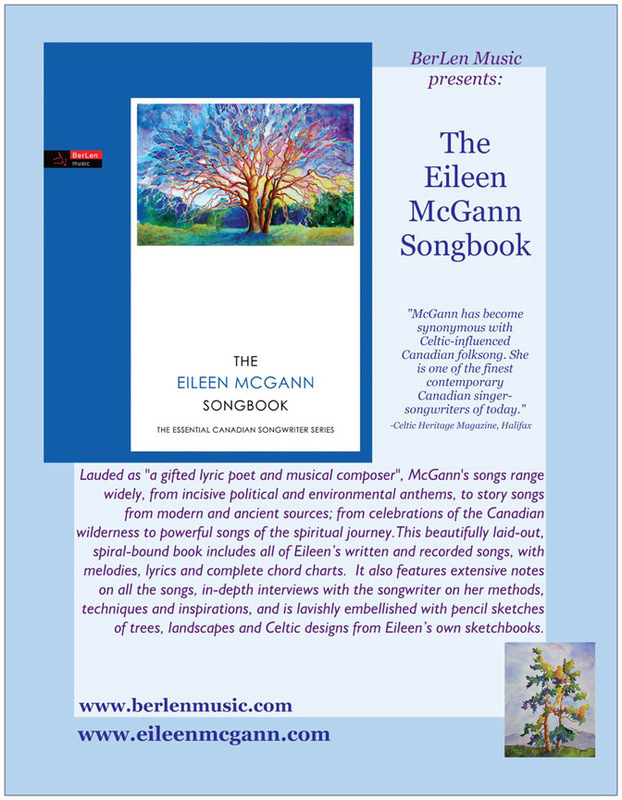 It also features extensive notes on all the songs, in-depth interviews with the songwriter on her methods, techniques and inspirations, and is lavishly embellished with pencil sketches of trees, landscapes and Celtic knotwork designs from Eileen’s own sketchbooks. Thematically, Eileen’s songs range widely, from incisive political and environmental anthems, to story songs from modern and ancient sources; from celebrations of the Canadian wilderness to powerful songs of the spiritual journey. These diverse songs are united by strong, singable choruses, flowing melodies, lyrical depth and a clear unified vision. Much more than just a songbook, this publication showcases the richness of her songwriting journey, and the stories and experiences that inspired her. The addition of the interview material, and dozens of sketches of the Canadian landscape show her artistic versatility and make this book one that both musicians and non-musicians will treasure. For almost thirty years BC- based Eileen McGann has toured her brand of Celtic-influenced Canadian songs across Canada, the US and Great Britain. Known for her intelligent, poetic lyrics combined with soaring Celtic-flavoured melodies, the versatile singer has released seven highly-acclaimed solo CDs, including the recent CFMA-nominated Pocketful of Rhymes, and the Juno-nominated Beyond The Storm. McGann was born and raised in Ontario, where she began her music career. After a decade in Calgary, Eileen moved to Vancouver Island in 1999, and continues recording and touring, as well as following her second profession as a painter of vibrant Canadian landscapes. She teaches workshops on songwriting, voice, traditional music, painting, Celtic knotwork art and creativity. The songs that perhaps most truly reflect the depth and wealth of distinctively Canadian songwriting are found in the folk and acoustic music scenes across the nation, and are not necessarily well known to the average pop radio listener. BerLen Music founder and publisher Jack Cooper hopes that the series will help ensure the legacy of Canada’s top songwriters by making their songs available across the country and around the world in a lasting and accessible format. Writing about every aspect of life, not just the romantic love songs that dominate the mainstream music genres, these songwriters, he believes, chronicle the vibrant grassroots stories of our nation. The Eileen McGann Songbook is the second in “The Essential Canadian Songwriter Series” that began with the publication of Ontario songwriter James Gordon’s “Pipe Street Songbook” in 2009. BerLen Music is based in Guelph, Ontario.